For the security reasons, people need to use their keys every single day and hence it’s vital to make it more appealing to the eye with your own personalized key chain. We at Delhi Printer proffer you an opportunity to grab unique engraved key chains that are perfect personalized gifts for couples. By utilizing the cutting edge technologies as well as the talent of our efficient work force, we are manufacturing and exporting a wide collection of key chains. Offered in various designs, colors and patterns, these are valued for their eye catchy designs and durable finish standards. 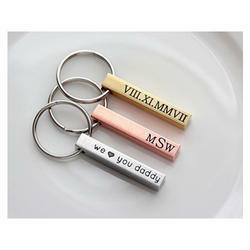 As per variegated requirements of experts, we bring forth for our customers exclusive array of Engraved Key Chains. We offer a wide range of brass key chains. Our nautical key chains are developed in numerous shapes and designs such as telescope key chain, ship wheel keychain, compass key chain and other marine key chain. The boatswain's pipe or flute key chain crafted from copper and brass. we offer several madels of quality boatswain's pipe.